"Prior studies demonstrate the shocking unavailability of most books published in the 20th Century, prompting The Atlantic Monthly headline: "How Copyright Made Mid-Century Books Vanish". The unavailability of new editions of older works would be less problematic, however, if little consumer demand existed for those works. In addition, the lack of new editions would be much less troubling if the works were easily available in alternative forms or markets. Newly collected data provides evidence of the demand for out-of-print books and then charts the availability of out-of-print works in digital form (eBooks and .mp3), in used book stores, and in public libraries. The situation with books remains dismal, although music publishers on iTunes seem to be doing a much better job of digitizing older works and making them available than do book publishers. Some theories for this discrepancy are offered". This blogger has had the pleasure of exchanging views with Paul Heald, who has done a considerable amount of work on the business of publishing and selling books that fall out of copyright (see eg here). In contrast with some academics who feel safest when dealing with purely theoretical issues and matters of economic or philosophical principle, Paul takes an acute interest in the world around him -- which is why the world around him should take an acute interest in him. That's a great line, but I can make it more accurate: "Prior studies demonstrate the lack of availability of most books". 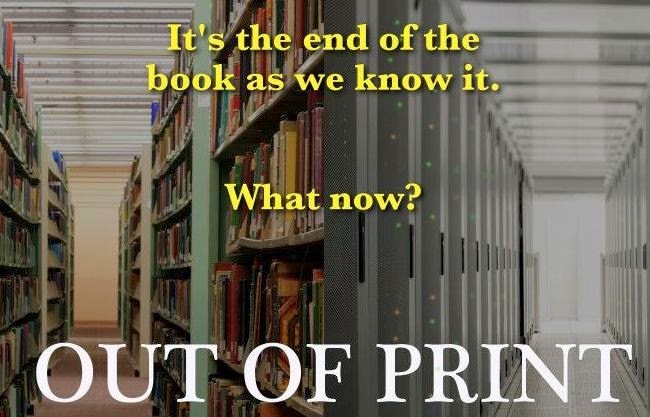 ie, most books published in any era are out of print, only the most significant survive (by whose judgment you might well ask), and their survival in print is dictated by basic economics (if no one buys them they are deleted from the catalogue). There are technological changes that mitigate this issue, but they in turn bring forth other issues (of which I'm sure Professor Heald is aware).